26 Mar How does RFID work? Radio-frequency identification or RFID pertains to a technology where a reader captures digital data encoded in smart labels or RFID tags through radio waves. How does RFID work? RFID uses radio waves to identify objects and gather information about them. The information gathered is entered into computer systems with little or no intervention from humans. RFID systems are composed of an RFID reader, an antenna and a smart label or RFID tag. RFID tags have an antenna and built-in circuit that are used to send data to the RFID reader, which converts the radio waves into usable data. Information gathered from the RFID tag is transferred to a host computer system, where it can be stored and assessed at a later time. RFID tags have a protective material that holds the components together and protects them from different environmental conditions. It comes in various sizes and shapes. RFID tags are either active or passive. Active RFID tags are equipped with an onboard power supply a battery, allowing them to transmit data all the time. Passive tags are cheaper to implement and smaller than active ones. This kind of tag requires an RFID reader before it can transmit data. Smart labels are different from RFID tags as they’re made of an adhesive label and use both barcode and RFID technologies. They can be printed immediately using desktop label printers. Smart labels have an RFID tag inlay and may feature printed or barcode information. RFID tags require more advanced equipment and are more time consuming to make. RFID can be used in a wide range of applications such as personnel tracking, inventory management, ID badging, asset tracking, supply chain management, counterfeit prevention and controlling access to certain areas. Applications that are currently using barcode technology can upgrade to a system that implements RFID or a combination of both technologies. RFID has many advantages over barcodes, especially because RFID tags can hold more data about an item than a barcode. RFID tags are not susceptible to smearing, ripping and other damages that may be suffered by barcode labels. RFID readers require a direct line of sight to passive or active RFID tags, while barcode reads need a direct line of sight to the barcode. An RFID reader is capable of pulling information from tags at distances up to 300′. It can also read or interrogate RFID tags much faster. An RFID reader can read 40 or more tags per second. A barcode reader can read tags at distances up to 15′ only. 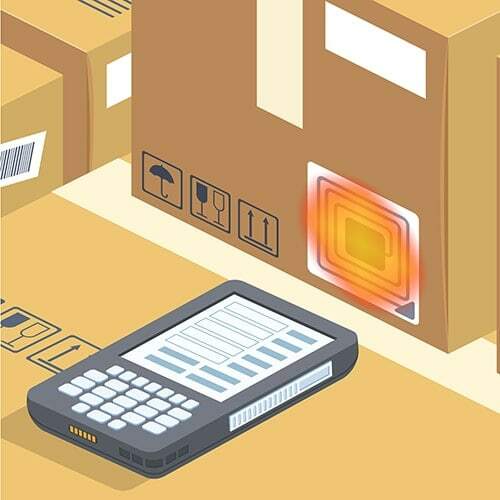 Reading barcodes is also more time-consuming as a direct line of sight is needed. If the item is not properly oriented to the barcode reader, it may take seconds to read one tag. The reusability and ruggedness of barcodes are limited due to the line of sight requirements. The line of sight is needed for barcodes, and the printed barcode must be visible on the outside of the item. However, this makes the barcode vulnerable to wear and tear. An RFID tag, on the other hand, is more durable as its electronic components are protected in a plastic cover. The tag can be implanted within the item itself, which guarantees better reusability and ruggedness. Barcodes cannot read or write devices. You can’t add to the information that’s already printed on a barcode. That’s not the same for RFID tags. These tags have written and read capability. The RFID reader can communicate with the RFID tag and alter information. However, RFID tags are usually more costly than barcodes. RFID tags can be encased in various materials. It comes in various sizes and shapes. RFID tags can be screw-shaped to make it easier to identify wooden items or trees. Animal tracking tags can be rice-sized and inserted underneath the skin. RFID tags can also be credit-card shaped. RFID devices have long been used to identify dogs. Permanent ink markings or tattoos can fade with age. It may also be difficult to get the dog to sit still while examining him for any markings. RFID tags make it easier to identify the owner of the dog. The anti-theft plastic tag attached to products in stores is an RFID tag as well. There are RFID microchips that can be attached to musical instruments to prevent theft.